A pilot, Pete Van Allen (George Brent, The Spiral Staircase), marries famous concert pianist, Sandra Kovak (Mary Astor, The Maltese Falcon), but they find out that the ceremony was not legal. Pete has second thoughts and instead of re-marrying Sandra, he proposes to an ex-girlfriend, Maggie Patterson (Bette Davis). After Pete apparently dies in the Amazon jungle, Maggie discovers that Sandra is now pregnant with her husband’s child and demands the baby for herself. Quintessential “woman’s picture,” a genre that traditionally has been dismissed by (mostly male) film scholars. 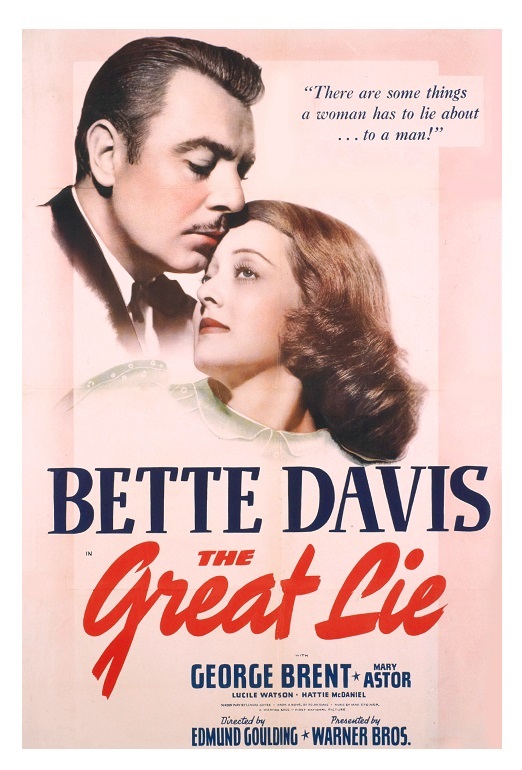 Though smugly labeled as just a mere “chick flick,” The Great Lie is immensely more fun than many high-minded films. While not a classic by any stretch of the imagination, The Great Lie, directed by Edmund Goulding (Dark Victory) from a screenplay by Lenore J. Coffee (Beyond the Forest) based on a novel by Polan Bank, is transformed into something that resembles art by Davis’s pop-eyed bravado and Astor’s sleek style. The story itself is pretty out-there, but everybody acts as if they believe every word they’re saying. Also, behind the admittedly hokey premise there is an attempt to explore women’s attitudes in the ’40s. That alone makes the movie worthy of a whole lot more respect than what it has received. At first, I thought the movie wanted you to hate the pianist because she had chosen career over motherhood. But after a while I began to realize that there is more going on here than what I initially thought. Neither Maggie nor Sandra is your typical ’40s woman. Astor, with her very non-1940s bob hairstyle, and Davis, who spends most of the movie wearing men’s slacks, and who in fact slowly assumes the role of the child’s father, buck gender expectations and make the movie interesting to watch. Davis instinctively knew that having a co-star of equal talent could make a huge difference. 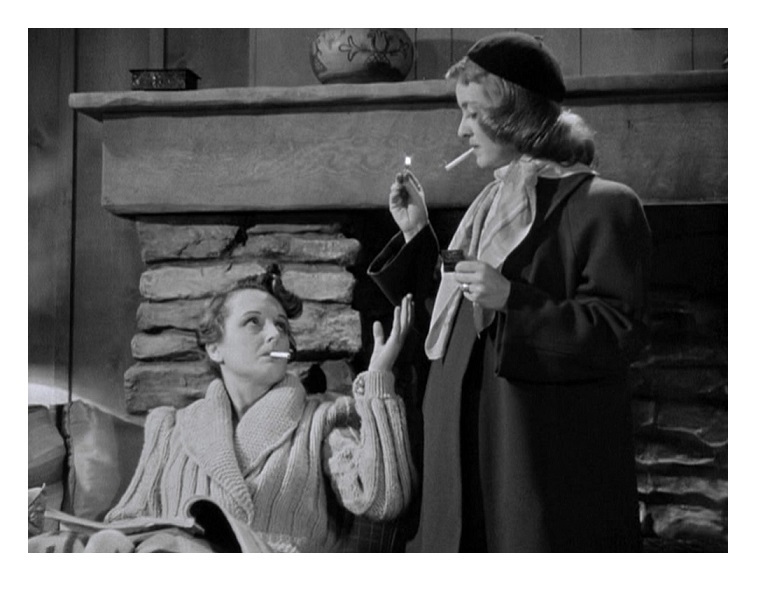 Davis initially suggested Katharine Hepburn as Maggie and herself as Sandra, but Kate wasn’t interested and Warners really didn’t want to add a huge salary to the film. Astor agreed to do a screen test and she was hired on the spot — Astor’s superb performance was rewarded with an Oscar for Best Supporting Actress. It’s such a colorful characterization that even Davis seems to be in awe of it somewhat. Davis’s instincts were right — the chemistry between the two ladies overcomes a flawed script. George Brent is at his generic leading man best. The actor, who was a licensed pilot in real life, actually did his own flying. Hattie McDaniel plays one of her many maids, but I was delighted to see that she has more screen time than usual. McDaniel has more lines than Brent! Apart for her role as Mammy in Gone with the Wind, this is probably her most substantial movie role that I’ve seen. Sam McDaniel (Captains Courageous and Flamingo Road), Hattie’s brother, plays Jefferson. Jerome Cowan (Pocketful of Miracles) and Lucile Watson (Watch on the Rhine) also appear in supporting roles. The Great Lie is a lot of fun. The dialogue is snappy (“whoever heard of an ounce of brandy?”), the performances are pitch perfect, and the direction is accomplished. B&W, 108 minutes, Not Rated.